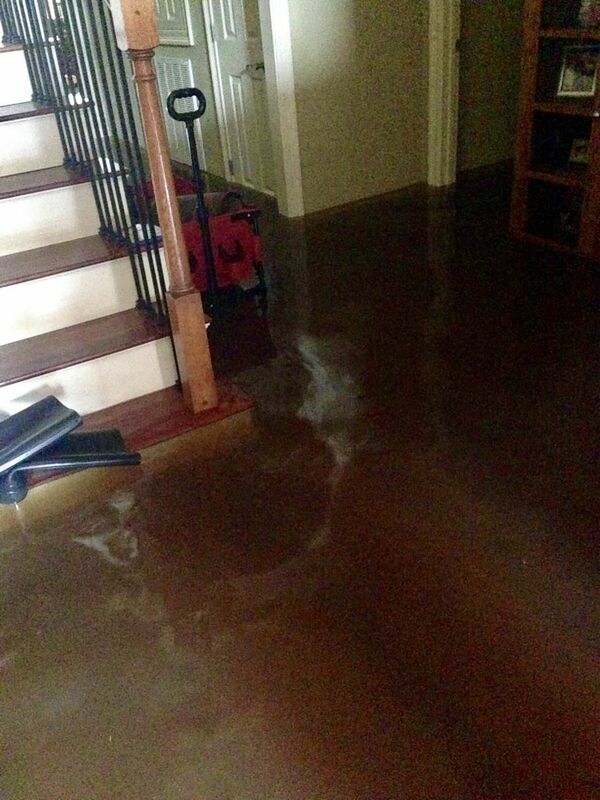 A look at the water inside the home of Chris and Lisa Blanchard during the Great Flood of 2016. A look at The Carter Plantation clubhouse during The Great Flood of 2016. Chris Blanchard and daughter Emma make their way up the driveway of their home in Carter Plantation during The Great Flood of 2016. A look at the water mark left on supplies in a closet in Lisa Blanchard's portable building classroom at Springfield High following The Great Flood of 2016. Chris and Lisa Blanchard and their children, Preston and Emma, stand on the high point on the golf course where they were able to get cell phone service during the Great Flood of 2016. Chris and Lisa Blanchard are a bit hesitant to talk about it, even almost two years later. It’s not that they don’t remember what happened that Saturday in August of 2016. It’s that they know some people are still working their way back from The Great Flood of 2016 when their family has bounced back from it. “We got 2 ½ feet (of water), and it’s almost like I felt bad telling people that,” said Chris Blanchard, the newly named Springfield baseball coach. Still, like folks throughout Livingston Parish, the Blanchards do have their own story when it comes to The Great Flood. At the time, their home was on hole No. 6 in Carter Plantation. Chris said the family had a gauge to judge water levels thanks to the flooding earlier that spring, when water got high but didn’t reach the house, which is elevated from the golf course. He also said early reports on forecasted rains said to expect an output similar to those in the spring. “When the water came up and it stopped, we still had five or six feet of elevation … It was dry in March,” Chris said. With that in mind, on Aug. 13, the Blanchards went to work eyeing the rising water level using the back of their house as a gauge. Lisa said the family, including son Preston and daughter Emma, went to bed about 10 p.m., but around 1:30 or 2 a.m. on Aug. 14, a neighbor came and woke them to try to get them to move their vehicles. The plan was short-lived. “We tried to move our cars, and with no electricity we tried to go around the curve outside the little the cul-de-sac out here, and basically we didn’t know what was a pond and what was the road, so we had to turn around,” Lisa said. Another neighbor, who was out of town, learned of what was happening and had just one request. While they were there, they checked out the neighbor’s back porch to get an idea on where the water level was sitting, bringing something to Chris’ attention. Soon, the Blanchards were in the same predicament as by 8 a.m. water had made its way into their home. As the water kept rising, Chris said things got interesting. By mid-morning, people in boats started making their way back to check families who were stranded, but the Blanchards declined, in part because they were told a shelter in Springfield was full. “We were trying to wait it out,” Lisa said. The Blanchards also lost cell phone service, making it difficult to contact anyone. But Lisa said she and her neighbors found a high spot on the golf course, which enabled them to get cell service. Lisa was able to get in touch with her mother, and the family decided to leave the house and head toward town to meet Lisa’s mom on the other side of the bridge in Springfield. By boat, they got as far as the Carter Plantation clubhouse. “That’s as far as they could take us,” Lisa said. Another boat came a few hours later and took the group to Panther Road. That’s when Chris Blanchard, while riding in a boat on the golf course, was able to get some perspective on what was happening. The journey out of Carter Plantation wasn’t over. After the boat ride, the family began walking down the road while fighting the current, which was a bigger challenge for Chris Blanchard, who carried daughter Emma on his back, making for an unforgettable 8th birthday for the youngster. As was the case so many times during the flood and after, the Blanchards got some help to finally reach their destination. The Blanchards eventually met up with Lisa’s mom, who took the crew to her house. Lisa said getting out was a relief, but at the same time, the weight of the situation for so many people was heavy on her mind. “Once we got there it was just, we could breathe,” she said. The Blanchards eventually found a rental house in Ponchatoula while trying to get the home in Carter Plantation cleaned up. Lisa said it took almost a week to get back to the home by car, meaning Chris would park a car by the clubhouse and walk back to the house – normally a four-minute drive – to make sure everything was secure. 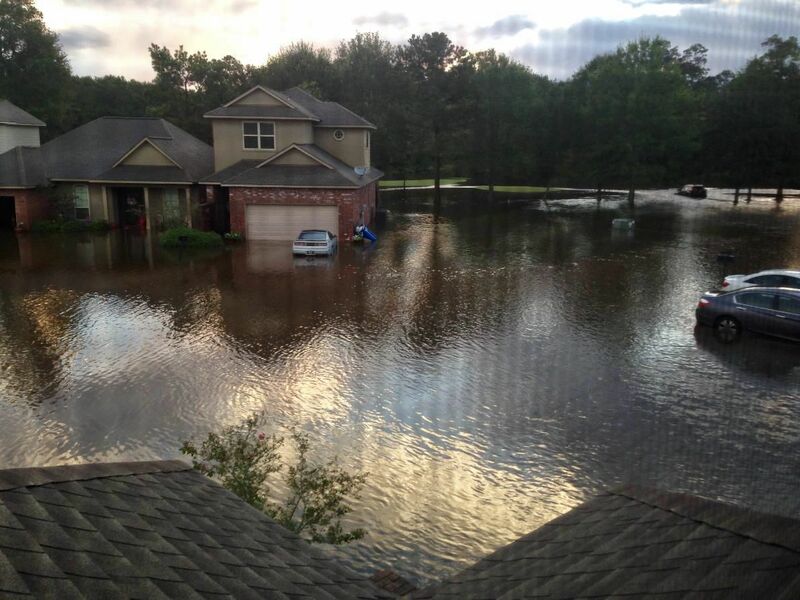 What he saw when he got to the house was, and in some cases is, a common sight in Livingston Parish. “It was just mass cleaning – ripping out sheetrock as and doing it as fast as they can to try to salvage whatever they can,” Chris said. And that was a challenge. Those clean-up efforts hit full swing in the weeks ahead, and Chris Blanchard, who was an assistant coach at Denham Springs High at the time, said that meant more of the community coming together. He said the DSHS baseball team did its part to help the process along. Lisa said everything came to a head for her personally when she returned to Springfield High, lasting just an hour into her first day of cleaning up. Eventually school got back into session, although a bit differently with DSHS and Live Oak attending classes at Live Oak High School on a split schedule. It made for some long days during football season, but Chris said it was almost therapeutic in a way. “To me the schooling part was actually easy because it was almost like a break in the day,” he said. “The kids were exhausted because they always had to go work in their houses and pull sheetrock and whatever they had to do. Chris said their flood experiences also brought teammates and classmates closer, saying the daily schedule for DSHS football players often included waking up at 6 a.m. to continue cleanup efforts on their homes, practice, school and returning from school to sometimes unfamiliar surroundings that became home for a time. It took the Blanchards about nine months to get back into a home. They were renting their home in Carter Plantation at the time of the flood, and like many people, bought a new home after their experience – but they didn’t have to go very far to get there. “We’re about 50 feet from the other house,” Chris said. “But it’s ours so …,” Lisa added. Lisa said the flood brought her family closer and the community’s support for its own played a big part in the family remaining in Springfield. “We knew that this was where we wanted to be,” she said. “We knew that we wanted to be in the community. We knew that we loved the schools and we loved our neighbors and we loved everything about this area. There’s no doubt the Great Flood left an impression on students who will be going into their senior year this year, but Lisa said from what she’s seen and heard, those students aren’t letting it define their high school careers. MORNING UPDATE | Livingston Parish headlines from August 7, 2018! Check out these Livingston Parish headlines from August 7, 2018!